Do you read Sports Illustrated? It has been one of my favorite magazines since I was a teenager, and the thing I love best about it is the quality of the writing. While most magazines are written at an 8th-grade level, SI hits a higher mark, and it’s not unusual for me to have to go to the dictionary or encyclopedia (how quaint) to understand a word or reference. Would you put this on your wall? In the NFL Preview Issue a couple of weeks ago, SI included a poster sponsored by DirectTV. It’s huge, and as soon as I opened it, I doubted my presumptions about the educational levels of the readers – or, at least, SI’s understanding of its readers’ education. This poster is a classic example of meeting the needs of an advertiser and doing little to serve the needs of the audience. The entire poster hangs on the tagline, “Every Game. Every Sunday.” I was immediately confused because the NFL has been playing games on other days of the week since the late 1960s. 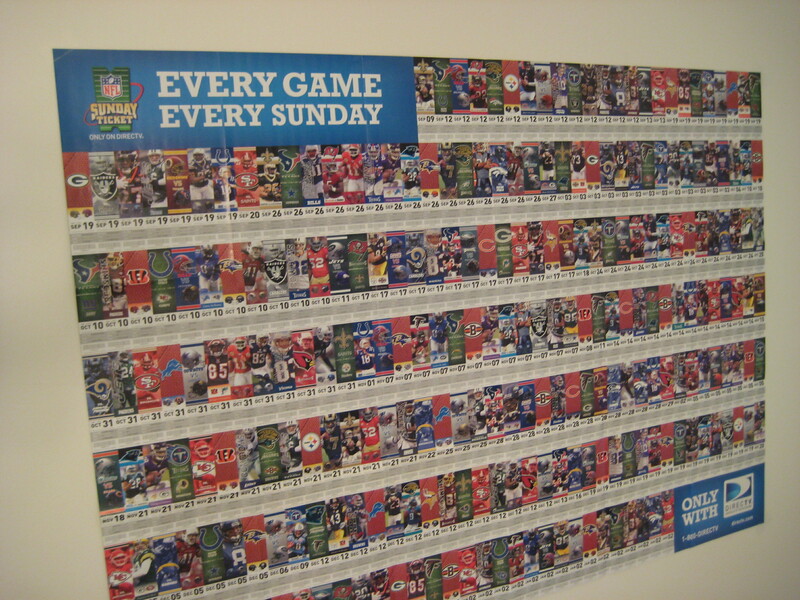 So, the first thing I did was check to see whether the poster had every game, or only every game that is played on Sundays. Answer: Every Game. The tagline, while clever, is wrong. I like football and have spent too much of my life watching games. To be honest, though, I really don’t care about the match-up between Atlanta and Cleveland October 10. Or Jacksonville vs. Buffalo the same day. I will be all over the Bears game (don’t care who they’re playing) and Packers vs. Redskins that day. Point? Very few people are interested in every game. We only want the schedule for the teams we follow plus big matchups. You rightly can ask if I got the scheduling information for that last paragraph from the poster. That would prove some usefulness. I didn’t. The information for all the games appears in searchable databases on the internet, which are much more usable and dynamic than this poster. A poster? Really? Now I’m sure there are people who will hang this thing up somewhere, but I’m also pretty sure the age of the average SI reader is greater than 15, which is when I stopped decorating with posters. Finally, binding this poster into the magazine required a small engineering feat and yards of glue. To read the magazine I had to remove the poster, scrape the glue off my hands, and tear out the heavy inserts. The result was a torn up magazine that delivered a lower customer satisfaction level. What did I gain from this effort, this wholesale slaughter of trees? It had no value for me, actually made my user experience less pleasant, and generated another heap of trash. For DirectTV the value is different. 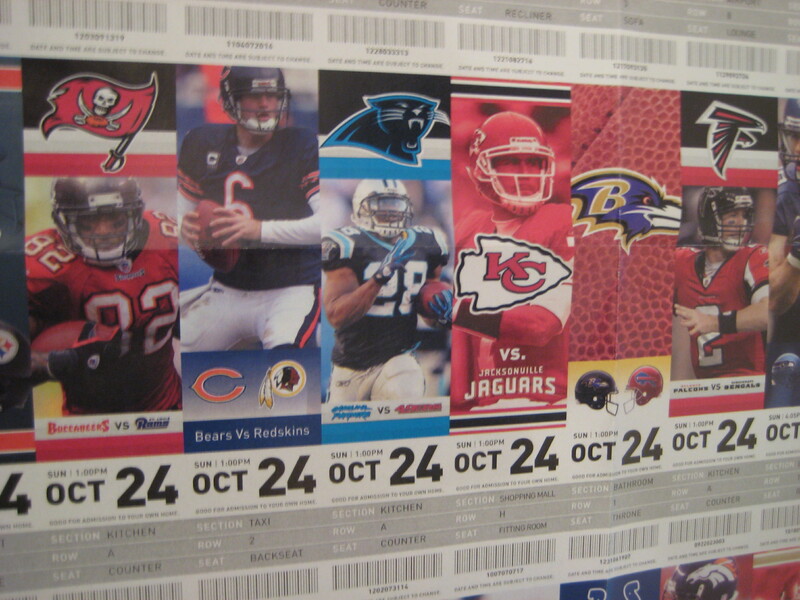 The poster raised awareness of its brand and showed how complete its NFL broadcast schedule is. But, the advertiser can achieve the same goals with a far less invasive advertising package that doesn’t risk alienating readers. Sorry, SI, but you haven’t served your audience well on this, although I’m sure someone got a really swell commission. In the new era of communications and content marketing, I thought we had grown past this kind of Jurassic-like advertising strategy.